Happy New Year from Moore or Less Cooking Food Blog!! This is my first post for the New Year 2015. Wow. It doesn’t seem possible! It feels like it just was 2000! I baked an 8 pound ham the other day, so I had some leftovers. 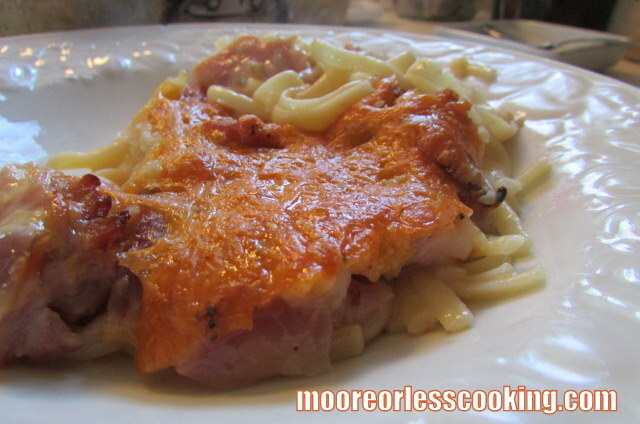 I wanted to create a pasta dish with ham, cheese and onions. So I did some experimenting, and this is what I created! It is so delicious! 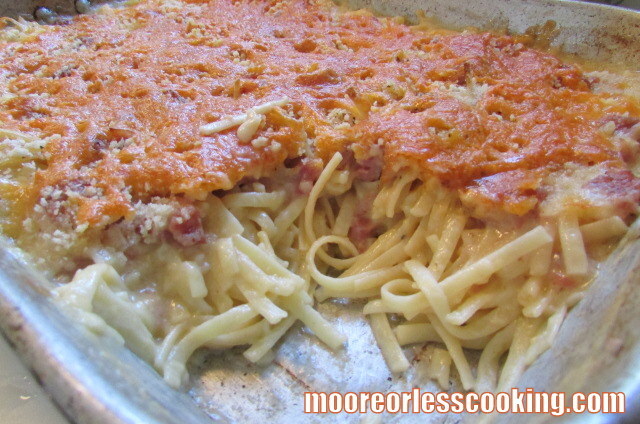 With a crunchy cheesy top and creamy pasta with ham and onion casserole. I was all out of small pasta, so I broke up a box of linguini into smaller pieces. 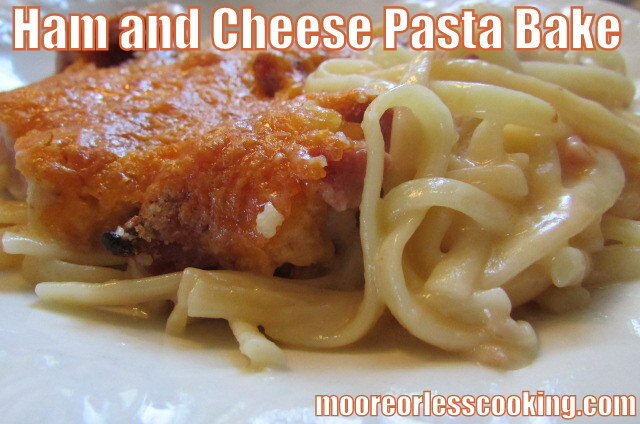 Ingredients are pasta, ham, sharp cheddar cheese, chicken broth, milk, panko crumbs, butter, fresh ground pepper. Hubs is crazy about ham and my kids are crazy about mac and cheese, so this is the perfect combo! No need to add any salt, the ham gives it the perfect salty flavor. The great thing about this recipe is that you can use any kind of cheese that you have in the refrigerator, Jack, Muenster, Asiago, Goat, Pepper Jack, or a combo of what tastes good to you! This casserole reheats very well, it would also be a great idea to bring to a friends house for the holidays or if you would like to share a casserole. Prep is easy and you can have a delicious meal in under and hour. 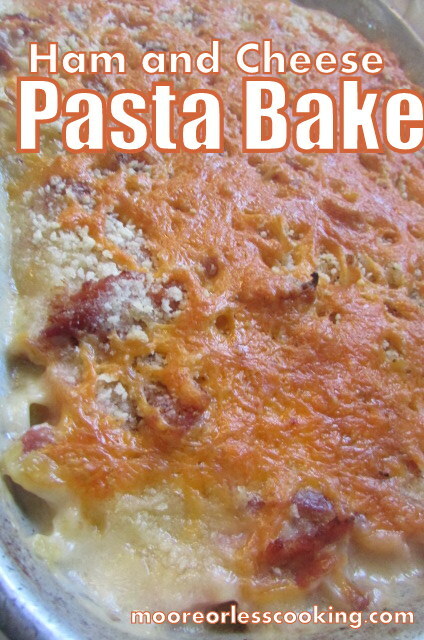 An easy and delicious pasta dish including ham and cheese, with a crunchy top and a creamy pasta bake! Pour cooked pasta in pan. Set aside. In a Sauce pan, on medium heat add 1 TB butter, saute onion until soft, add ham, saute for another 2 minutes. Pour onion and ham mixture over pasta. In a separate sauce pan, make a Bechamel sauce, saute 2 Tbsp butter over medium heat, add 2 Tbsp heaping full of flour, stir and let cook until golden brown and bubbly, pour in chicken broth and milk, stir until sauce thickens. Add 1 cup Cheddar Cheese. Sprinkle Panko crumbs over sauce. Sprinkle the rest of the Cheddar cheese over top. Bake in oven for 40 mins or until golden brown and bubbly. This looks fabulous Nettie! I feel like cooking a ham, just to make this, LOL. Looks good and easy to make too! I can always use easy! Thanks for sharing it with us at Foodie Fridays! Pinning!